Bento for Kidlet: CSN Review and Giveaway! I was recently given the opportunity to do another review and giveaway with CSN Stores. I have to say that the I was hesitant the first time I did this but I have found them to be a great site to work with! I have nothing but positive things to say about their selection and the ease of use of the sites. I could spend all day browsing through the vast number of items! After about a day of browsing I finally decided to use my $30 credit for this 7 QT Hamilton Beach Slower Cooker. My old slow cooker was about half this size and the knob had broken off making it impossible to tell whether you were cooking on high or low....which is a problem lol. I will admit to having no idea how big this was really going to be. I had it in my head that it would be slightly bigger than our other crockpot but man....this sucker is HUGE! I can feed an army :D You can get two racks of ribs in there or two giant roasts. I have been cooking up a storm and freezing the leftovers for easy weeknight meals. I've also made the world's largest batch of chili by request of the Kidlet. 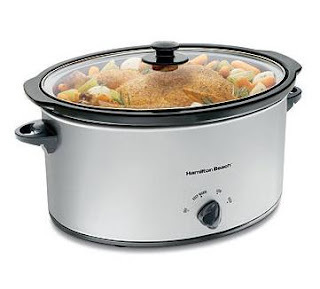 I highly recommend this slow cooker, it works amazingly well AND clean up is a breeze! The only thing that I found sad was that the booklet of recipes did not come in English at all. I believe there was French, Spanish, and Chinese. But no English. Not a huge deal but I do enjoy the recipes that come along with a product so it would have been nice to be able to read them without getting out one of our foreign language dictionaries. And now for the best part, you can have fun shopping too! CSN has graciously agreed to give away a $30 gift credit to one of my readers! *Giveaway Rules* - You must complete the mandatory entry before any of the optional entries. If your email is not visible on your Blogger profile, please be sure to leave it in the comments! Tell me what you want to use your $30 credit for! The winner will be selected on 8/17 via random.org and will have 48 hours to respond to my email. Thanks! Disclosure: I was given a $30 credit to CSN stores to facilitate my review. No other compensation was given and the views expressed above are entirely my own. I would buy my kiddos the choo choo train play tent. I'd use it toward a guidecraft kitchen helper. Thanks for the chance! I would use it towards a food processor! I would love to get my daughter a step 2 waterwheel table for her birthday! I'd put it towards a Kitchenaide Stand Mixer!! I have been thinking of a gift for my niece and I like the Elite Products Single Round Bean Bag. It is perfect for a 6 yr old. I would buy a blender so I could make smoothies!! Yummy! I would get a new lamp. I'd use it towards a timbuk2 bag! I would use it towards a Ms. Bento lunch system, or curtains for my bedroom. Also, I follow your blog!! I would put it towards a kitchenaid mixer!! I'd use it to get a Water Bath Canner. I am very interested in that there crockpot you have. I have one, but it's little and only makes enough for 4 I think. I'd also like one that has 2 inserts (2 dishes) inside it so you can make 2 kinds of soup or a main dish and a side dish. So it would be a hard choice.